This week, while the rest of the French Fridays with Dorie crew was making Cinnamon Crunch Chicken, I was busy catching up with old recipes. It’s not that I didn’t want to make this week’s recipe, I did, but it turns out that speculoos cookies (the “cinnamon crunch” part of the recipe) are considered Christmas cookies here in Germany and will thus not be available for a couple more months. And since Dorie specifies that ”this recipe is best with store-bought” as opposed to homemade cookies, I decided to put this one on hold. So, what to make instead? As so often occurs my menu was dictated by my refrigerator, or in this case by my freezer; for there, hiding behind the ice cream, was a half portion of Dorie’s Sweet Tart Dough leftover from last month’s batch of cupcakes de chevre. With the dough already made and all the other ingredients easily found in my cupboards, Dorie’s Orange-Almond Tart seemed as good as made. With only half a ball of tart dough I decided to use an 8 inch tart pan and cut the rest of the ingredients down accordingly. Well, that was the plan anyway, but the week got busy and by the time I got around to actually making the tart I had completely forgotten to cut down my recipe, and instead ended up pouring a full batch of almond filling into my 8 inch tart pan. It wasn’t until I pulled the tart out of the oven, and compared my tart to the lovely picture in Dorie’s book that I remembered why that might not have been a good idea. As you can see in the below pictures, whereas Dorie’s tart is perfect on top, mine got quite brown and a little dry before the filling was completely done in the center. Oops! I set the tart to cool and went on about my day. For whatever reason I was not overly excited about this one to begin with, and then after messing up the proportions, I really wasn’t very hopeful. However, my husband (the notorious sweet tooth) is always excited by the prospect of dessert and hadn’t been home more than two minutes before I found him in the kitchen cutting himself a slice. Not five minutes after that he was going back for seconds! Hmm, maybe I’d better give this tart a try after all. And oh my goodness, best FFwD dessert yet! This tart is amazing and I am so glad that I went back to make it. For those of you who would like to give it a try (and you should!) the recipe can be found here on Dorie’s blog. Her blog version is made with poached pears, but it is quite easy to substitute orange segments or, as she explains in her book, any array of fruits. I can’t wait to make it again! 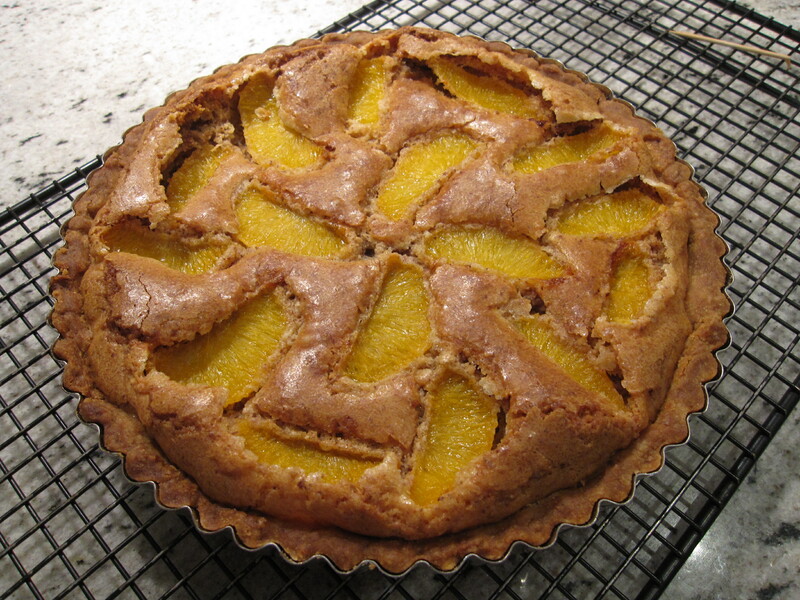 This entry was posted in favorite recipes, french fridays with dorie and tagged Around my French Table, dessert, pies & tarts. Bookmark the permalink. Ooh! Your rave review makes me more interested in this one. It’s been on the bottom of my list (and is one I would never ever make, if not for FFwD), b/c I’m not crazy about orangey desserts. Despite your snafus, that looks really good!! I have to say that I was not really looking forward to this one either, though generally I have nothing against orange desserts; honestly I don’t know why, it just didn’t look that interesting. But it is absolutely my favorite Dorie dessert yet. If you think you will not like the oranges though, she does mention a few alternatives. I may try it with the pears at some point. I’m happy you and your husband enjoyed it! I’ve made this several times since the original assignment date, and I’m always glad I did when I taste the almond cream. It’s so delicious! Clearly not a problem since mine was practically burnt on top and still tasted amazing! Your should definitely try it. That dessert looks yummy. I love Dorie’s bakes and this is one great one ! I’m glad you caught up on this tart. 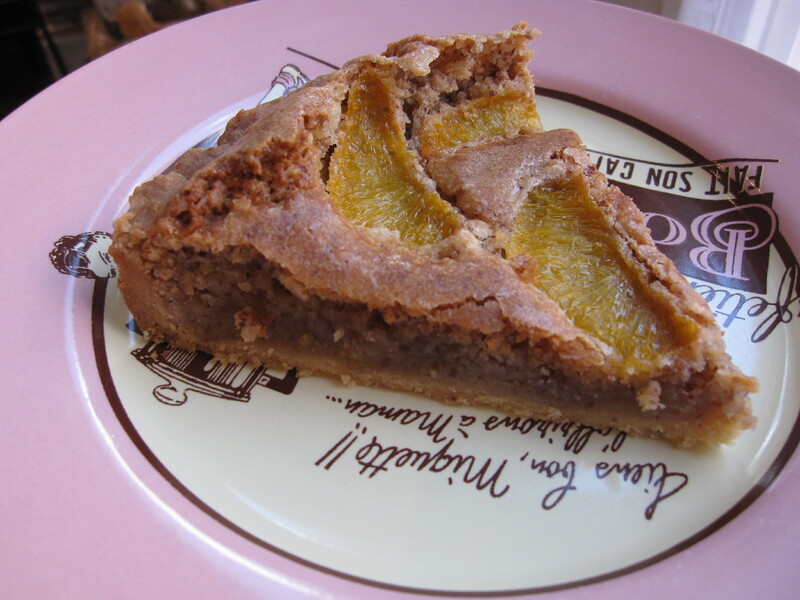 We loved this tart and I’ve made it a few times. A couple of times I’ve used different fruits…about a month ago I used pears. It’s always great and beautiful. You made the right choice this week. I definitely want to try the pear version, I think Dorie mentions that it is her husband’s favorite. 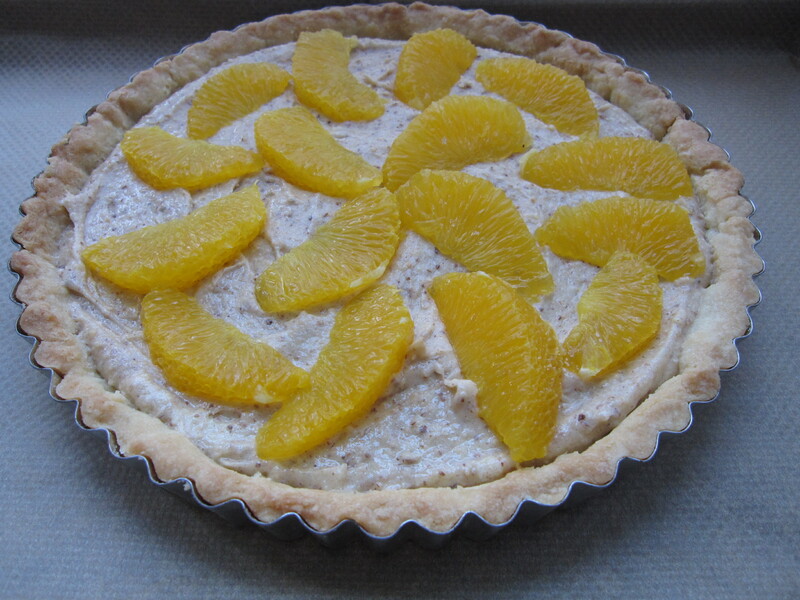 So many possibilities in one tasty tart, I am very excited to find a new dessert! Oh, I loved this tart, too! Gosh, I wonder why I don’t make any of Dorie’s recipes more than once??? And I hear ya about the cookies…I had to place a call out to all my foodie friends to find them! I loved this tart 🙂 Loved it. Loved it. Loved it. This was one of my favorite recipes we’ve made so far. Great choice. When I made it, I made individual tarts because my husband wouldn’t eat it with fruit. I also found that simply using the almond cream with NO fruit, topped with sliced almonds was delcious. Thank you! What a cute little idea, I will have to go take a look at my spoons and see if they would work. Her recipe also looks very interesting, lemon basil & olive oil madelienes. Hmm, could be tasty. This looks devine! Love an almond and orange baked good. Sounds delicious! You’ve inspired me to make a list of the recipes I’ve missed (I started really late) and play catch-up – this will have to be one of the first ones I tackle! Your tart looks wonderful! I need to make this again. I want to try the pear version too. 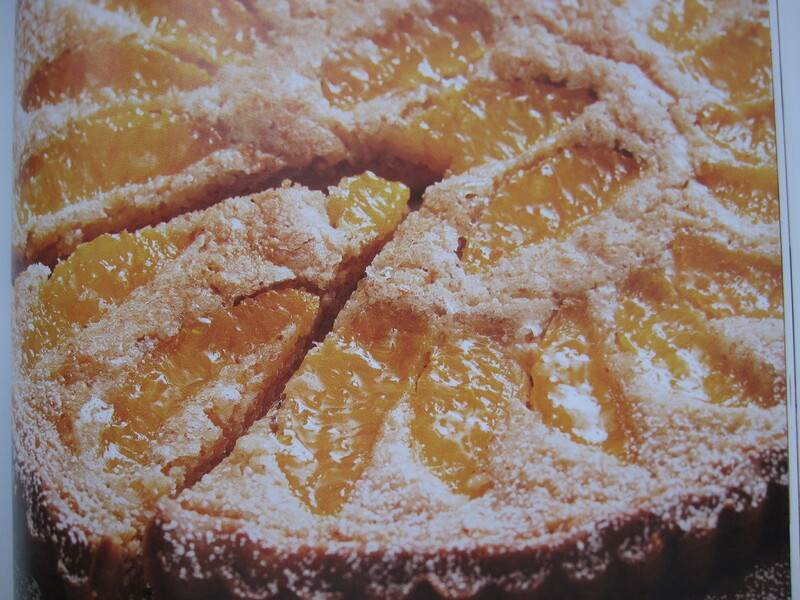 So many recipes… but I’m glad you liked this – the contrast of the juicy orange, the creamy filling, and crispy crust… YUM! I think your tart looks lovely! This is a great recipe and a good one to catch up on. I’m with dulceshome, too – can’t wait to try the pear version, now that they’re coming into season. This was a wonderful dessert…I might just have to make it again! Glad you enjoyed it! I think it looks lovely!